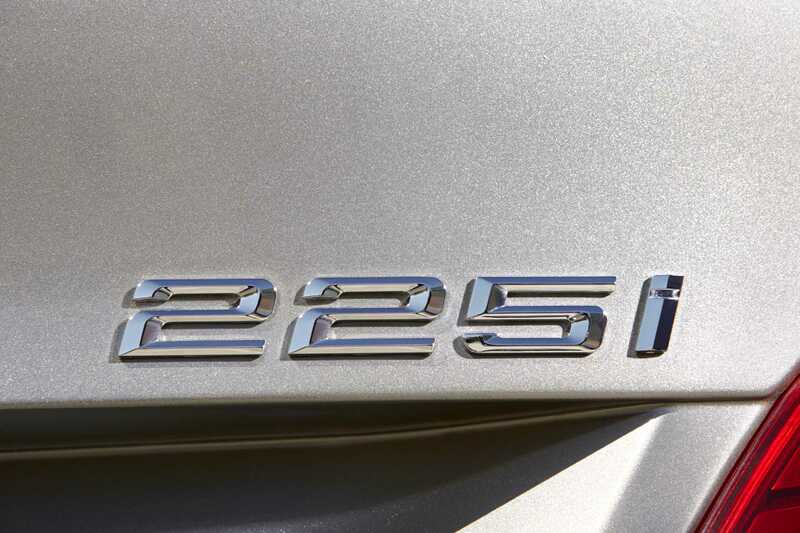 Here is a short lesson – "How to disappoint tens of millions of fans". 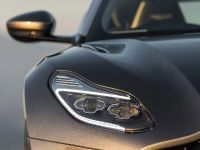 Firstly, create a brilliant car manufacturer with huge history in motorsport and awesome road cars. 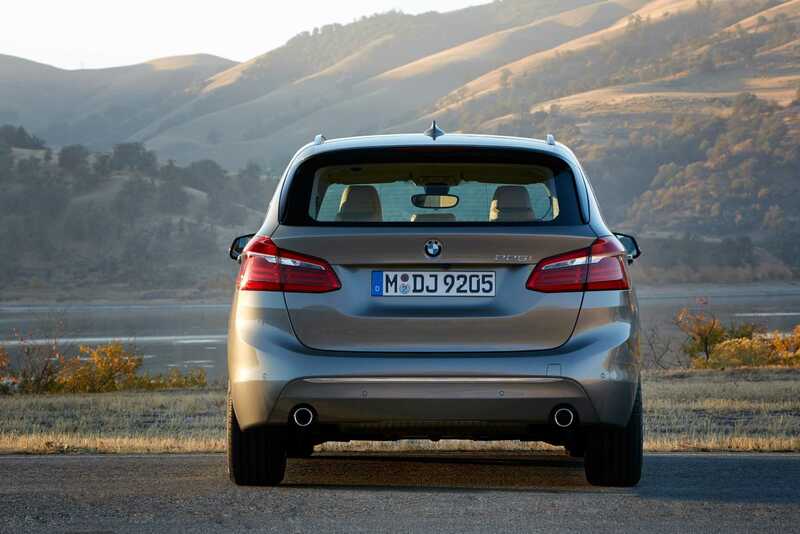 Secondly, produce only rear-wheel drive cars in your entire history and third, but most important – release a FWD car. 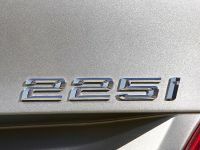 There is no doubt that fans of BMW all over the world will be so disappointed, that I don't have words to express it (including myself). 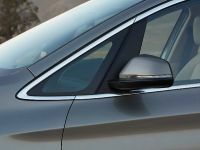 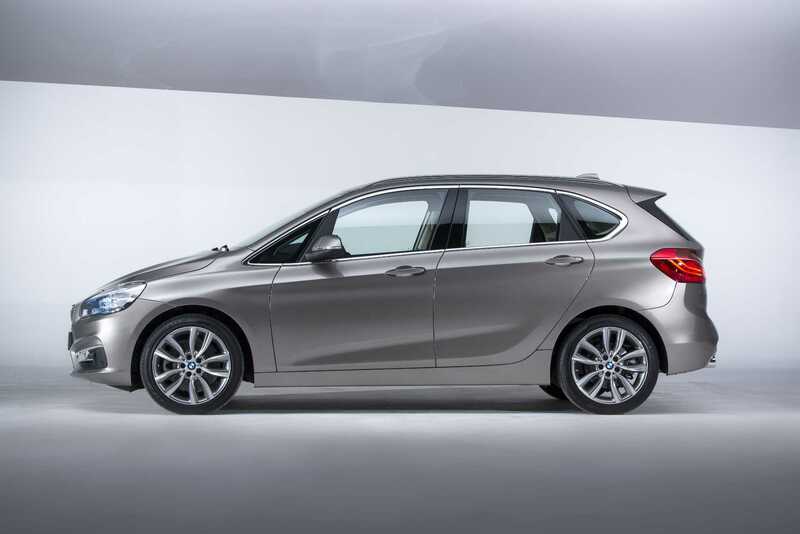 Enough for the disappointment, actually the all-new Active Tourer is a great car, but it really needs to have a different badge… a Mercedes-Benz one for example. 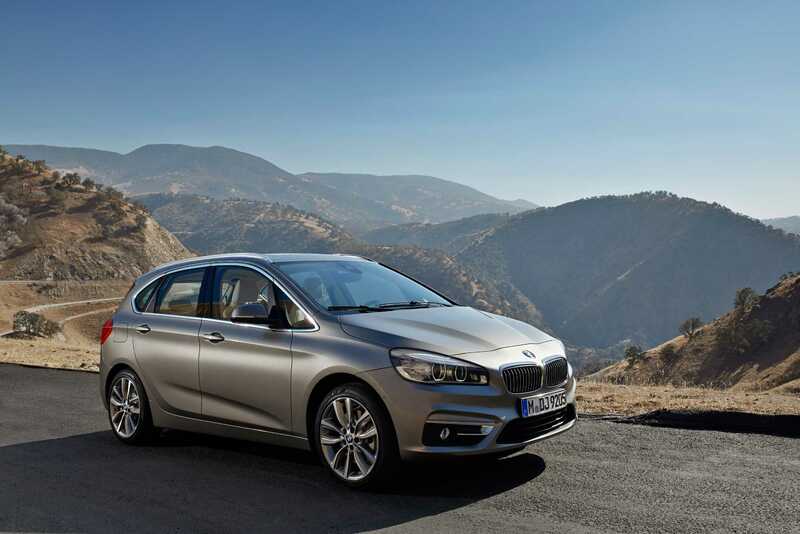 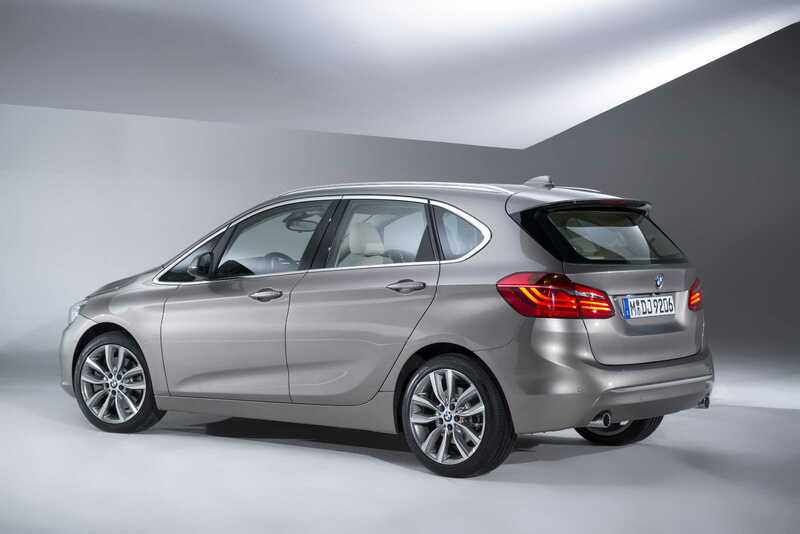 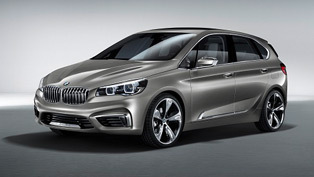 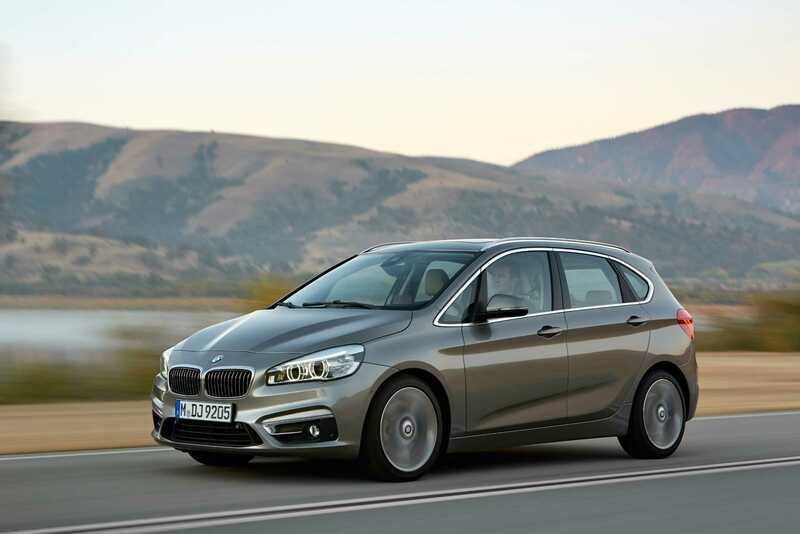 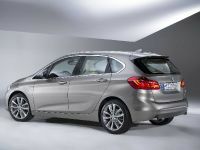 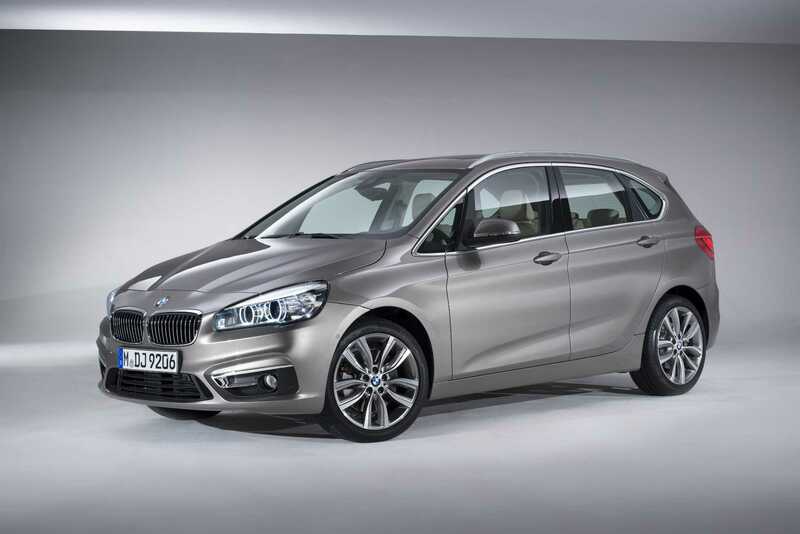 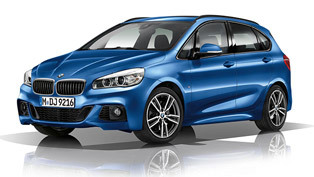 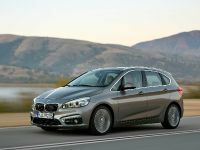 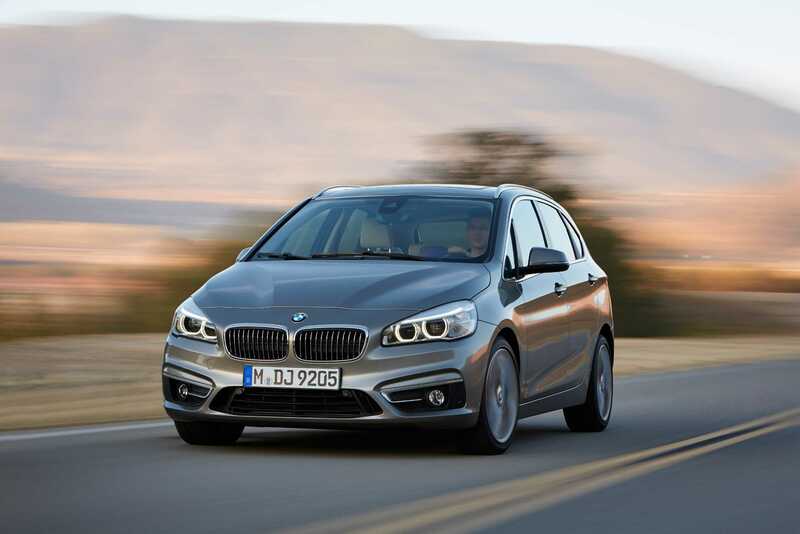 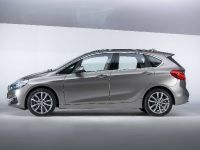 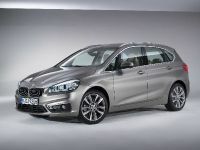 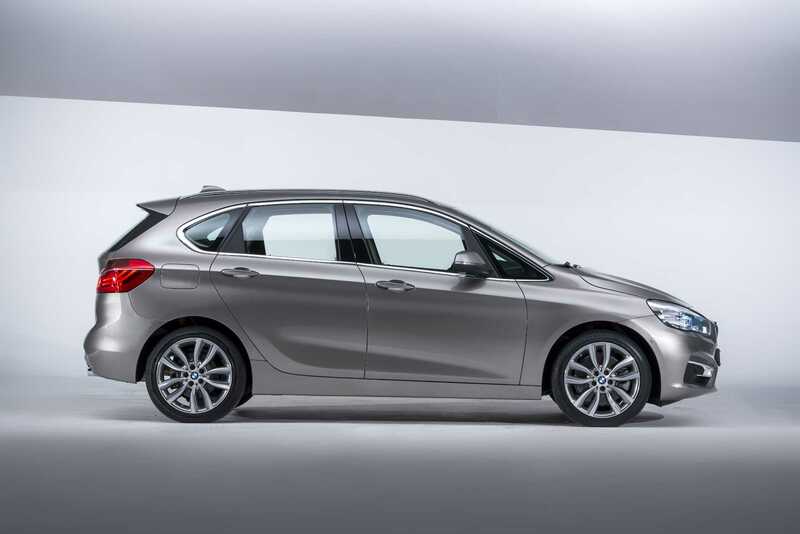 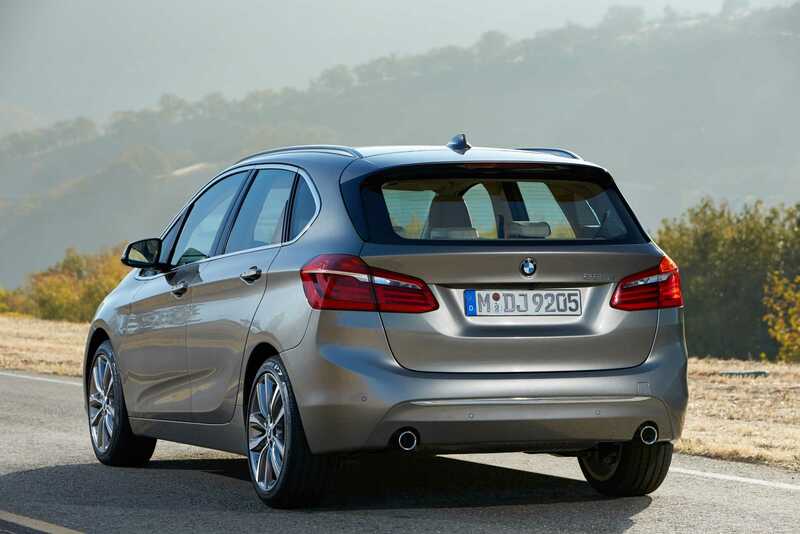 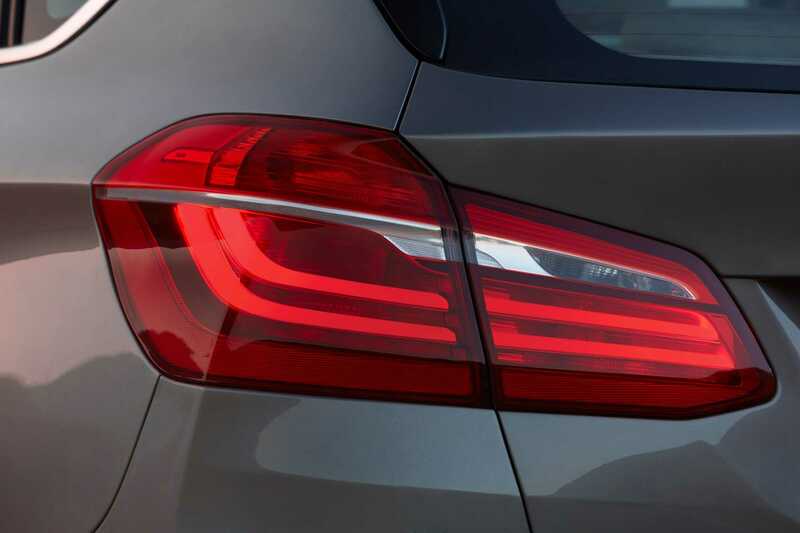 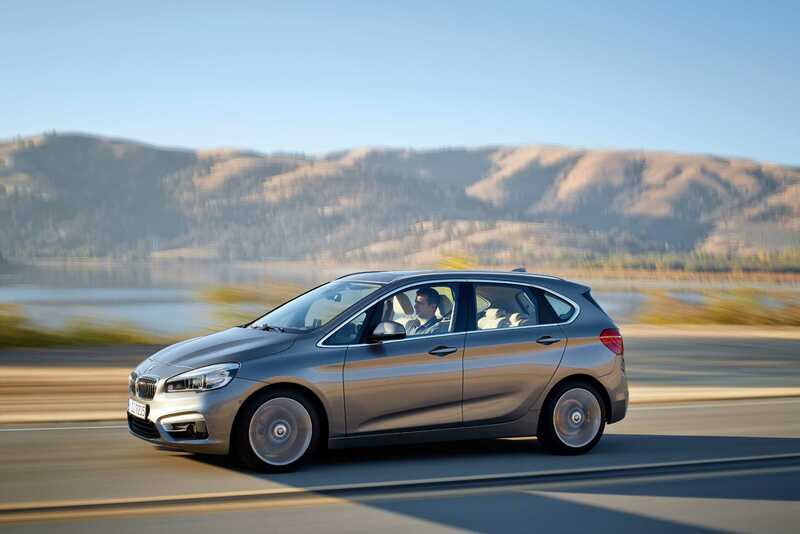 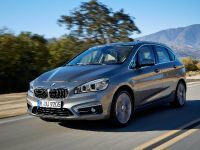 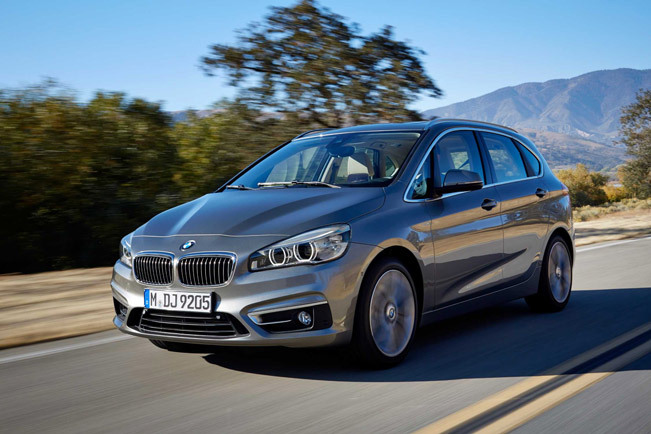 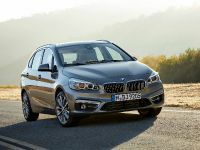 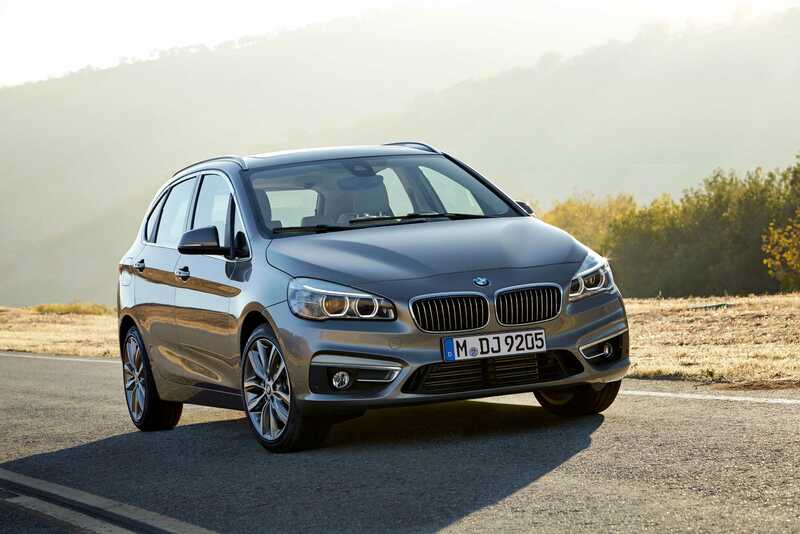 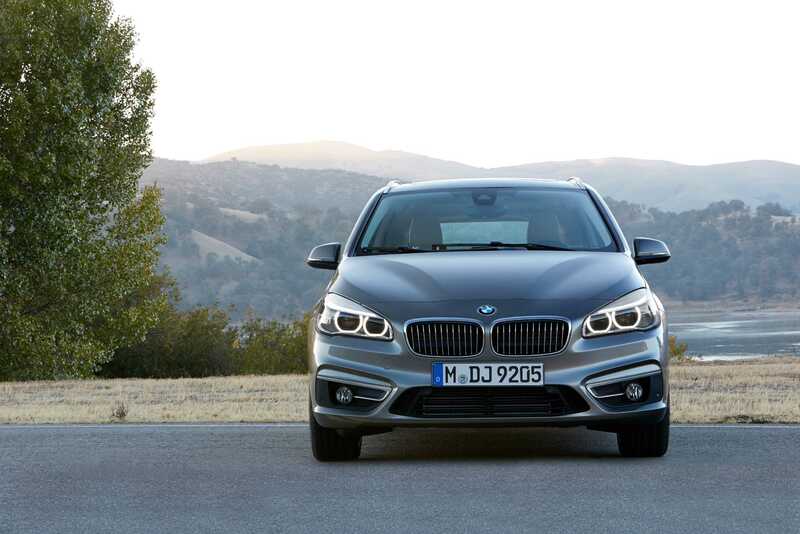 2014 BMW 2-Series Active Tourer will make its official debut at the Geneva Motor Show, next month. 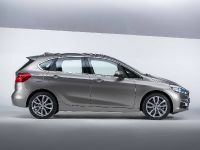 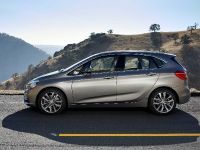 It was previewed by the Concept Active Tourer, which is the same as the production model. 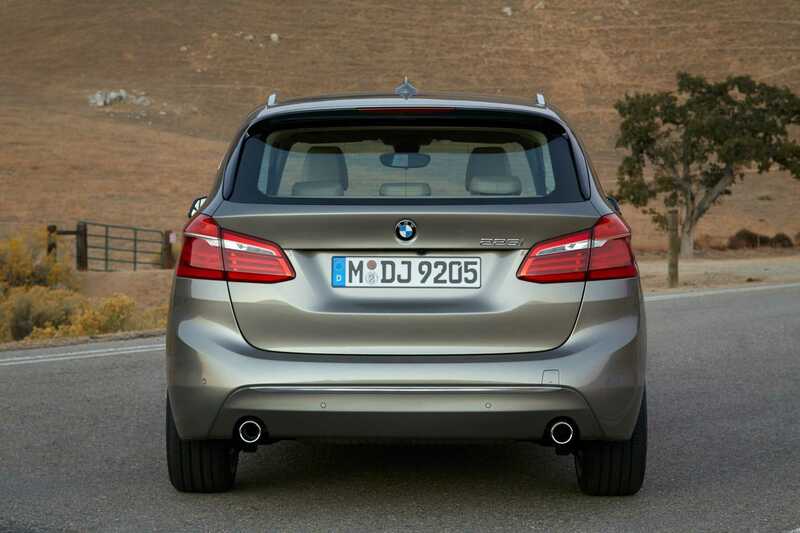 All fans and customers had the hope that BMW will actually make it RWD, but alas. 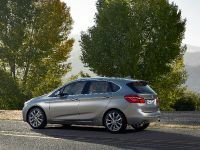 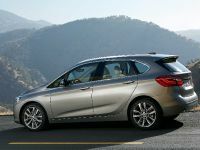 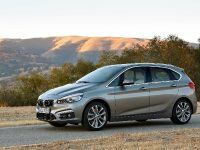 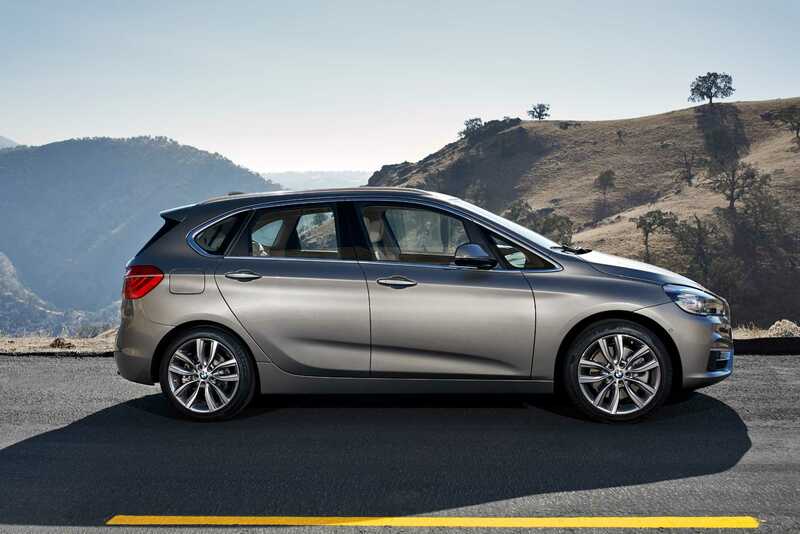 Otherwise, the 2-Series Active Tourer is a typical BMW. 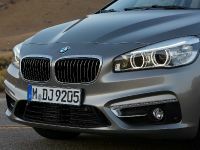 It has the recognizable kidney grille, twin circular headlights and the familiar Hofmeister kink. 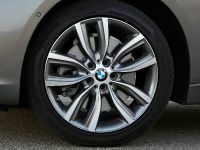 The dimensions are 4,342mm long, 1,800mm wide and 1,555mm tall with a wheelbase of 2,670mm. 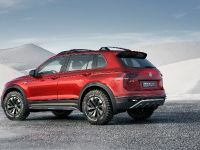 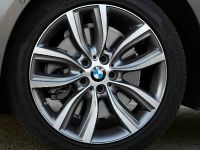 The exterior can be opted with a Sport Line package that has high-gloss black accents, special air intakes and exclusive 16" or 17" alloy wheels. 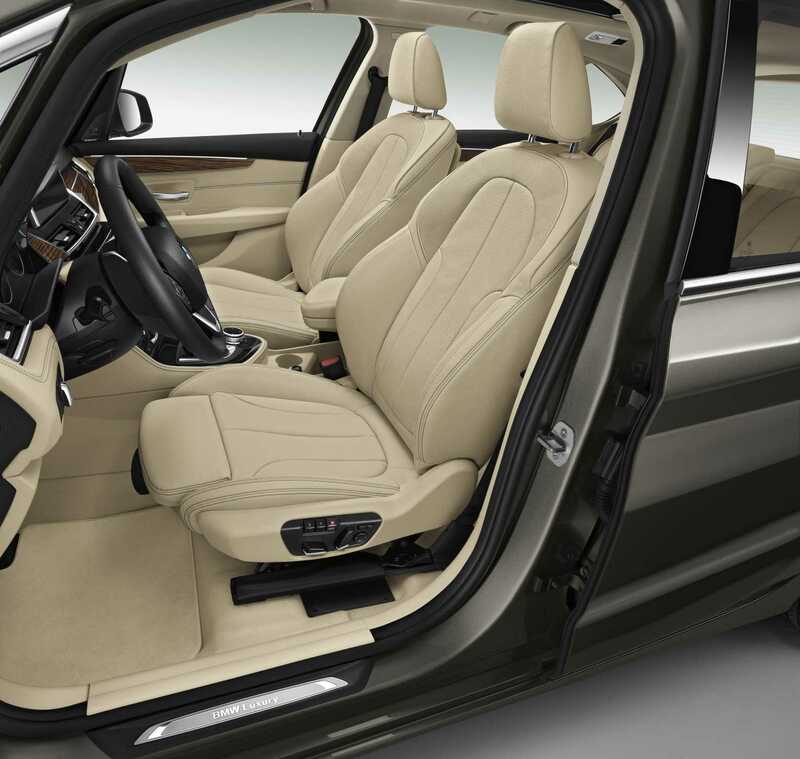 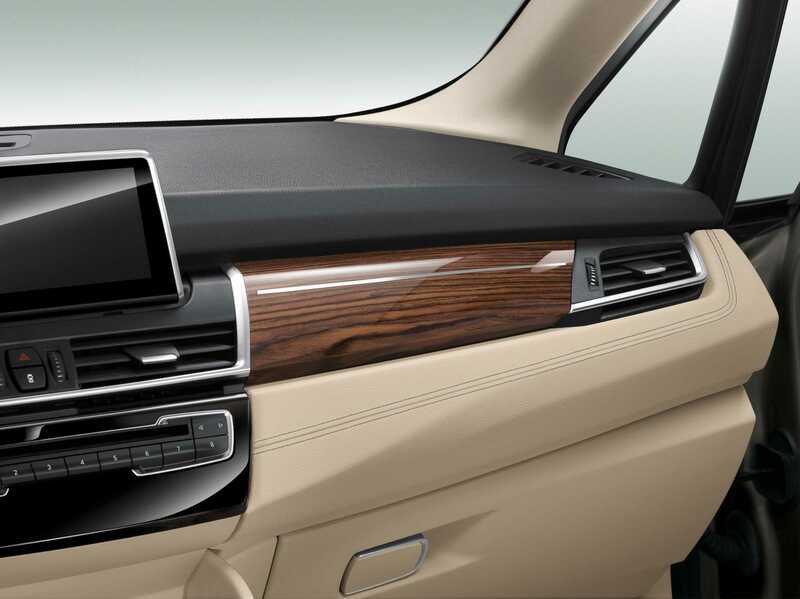 There are also sports front seats, high-gloss black trim and contrast stitching for the interior. 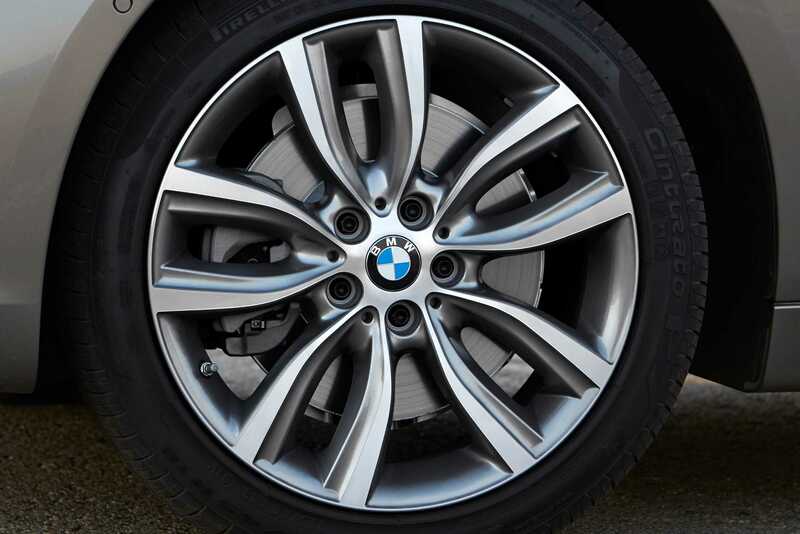 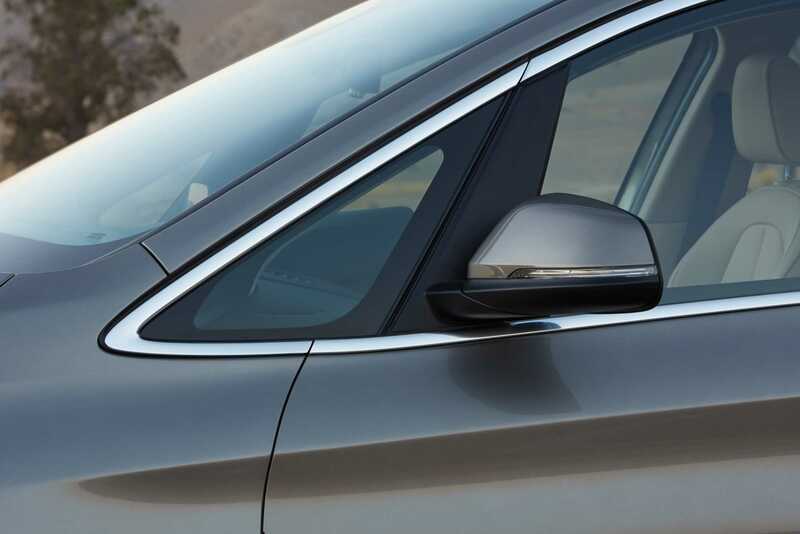 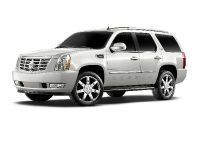 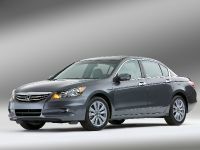 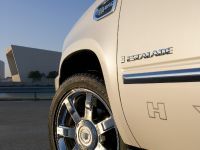 The Luxury Line adds high-gloss chrome grille and different 16" or 17" alloy wheels. 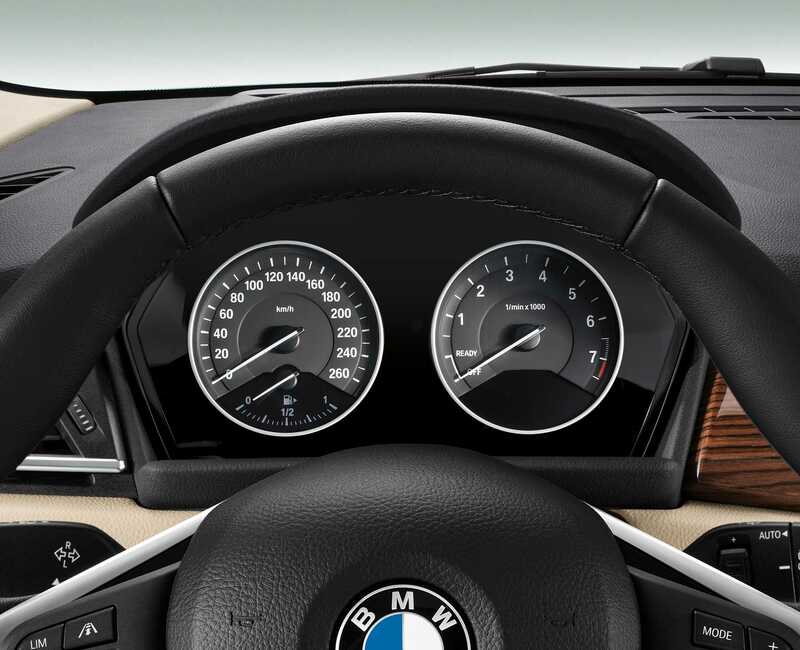 There is also a leather sport steering wheel, different seat upholstery and some chrome accents. 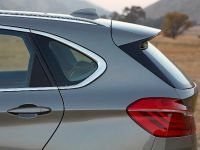 The top-of-range trim level – the M Sport Package boasts a complete aerodynamics package, a high-gloss black grille, a sport-tuned suspension dropping the ride height by 10mm and 17" or 18" light alloy wheels. The interior gets an M leather steering wheel, leather sports seats, an anthracite roof and M logo all over the place. 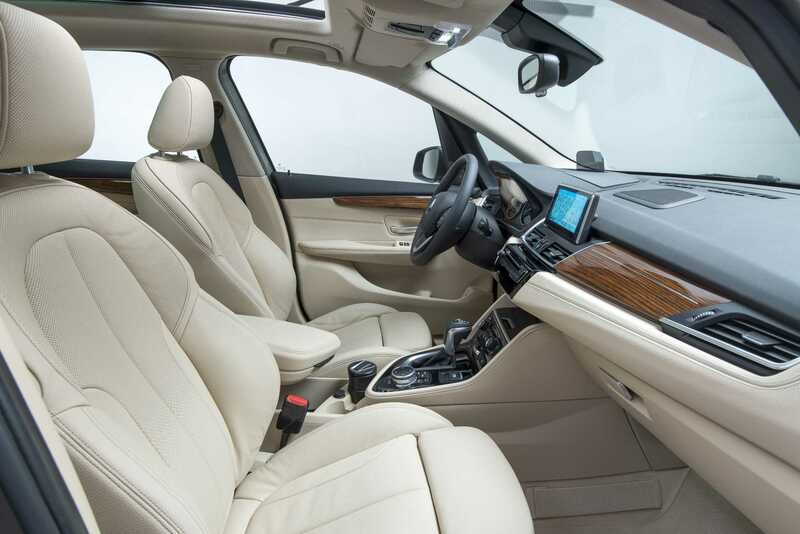 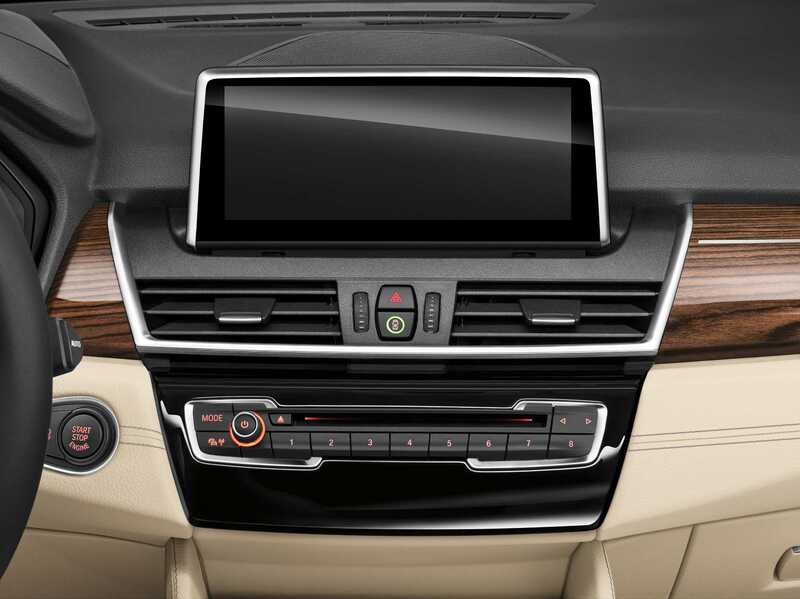 The interior comes with the typical driver-centric design. 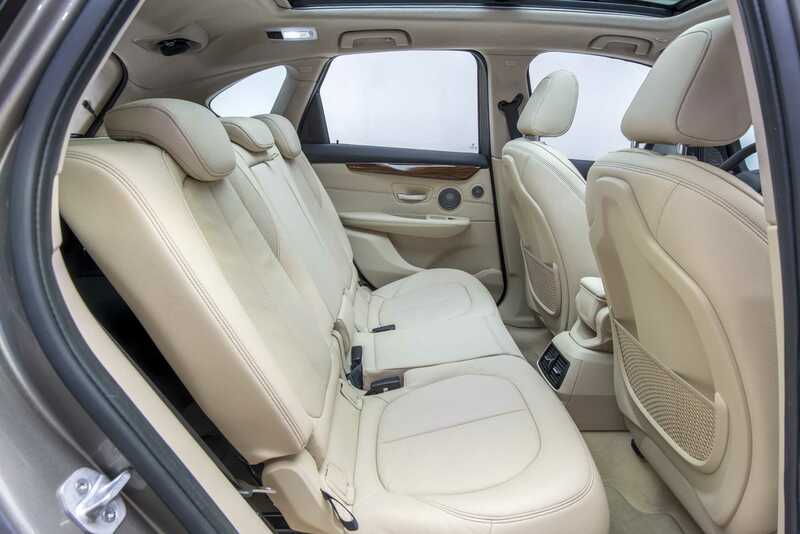 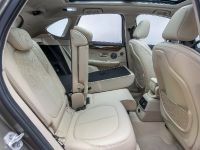 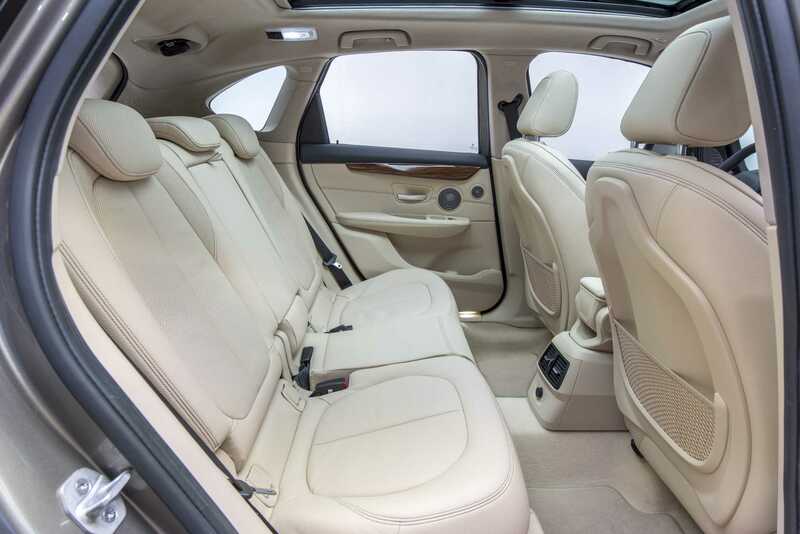 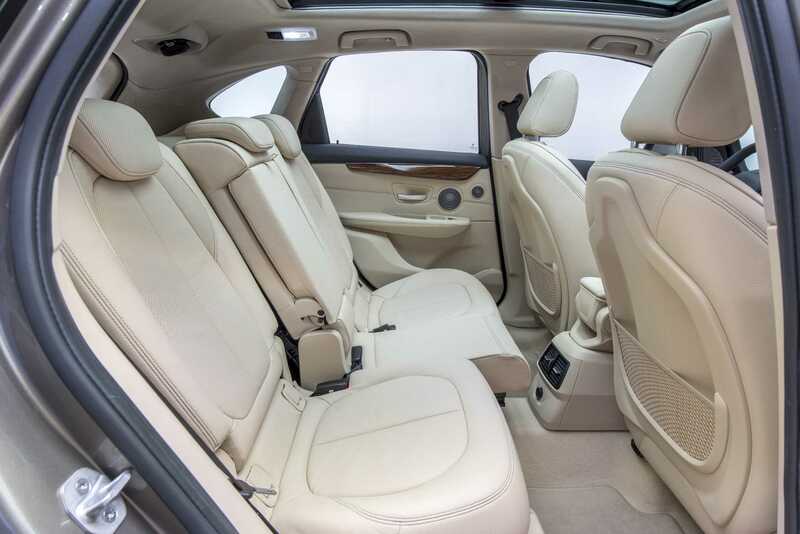 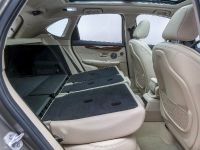 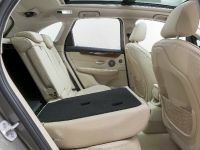 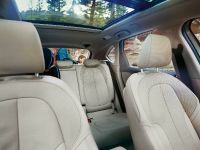 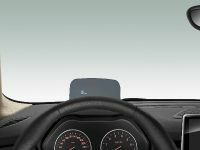 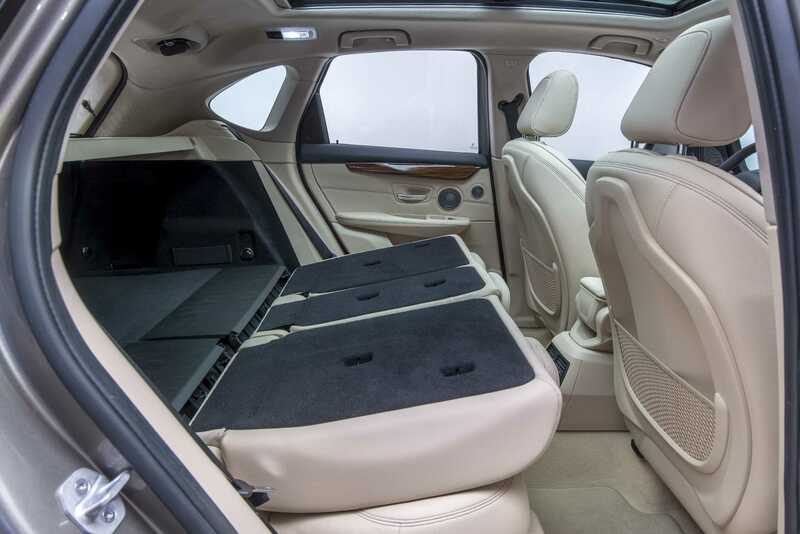 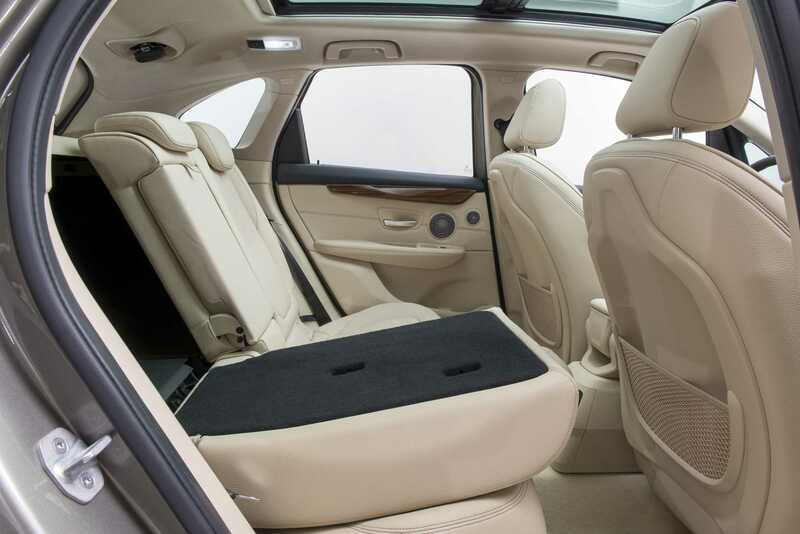 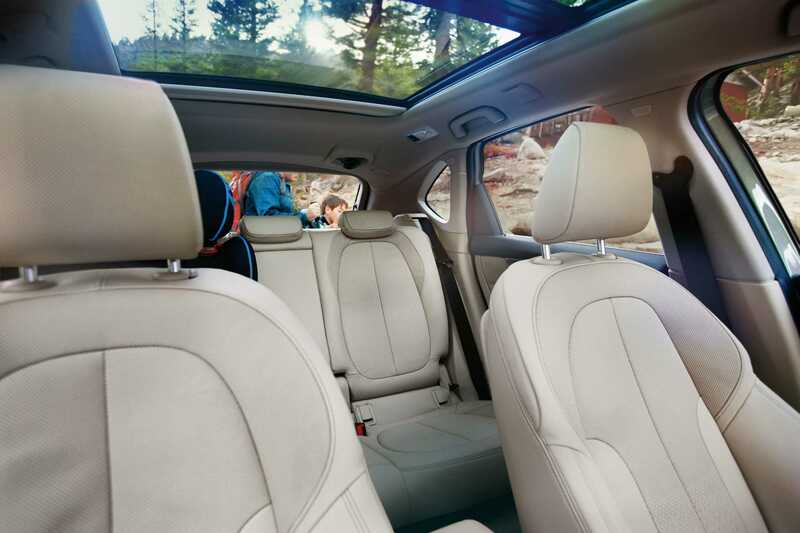 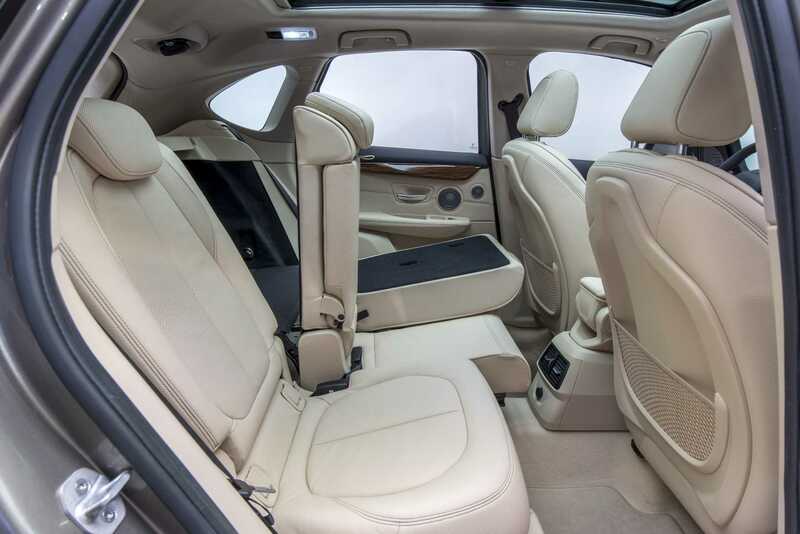 There is a folding front passenger seat, a 40:20:40 split-folding rear seat and a head up display (available as an option). 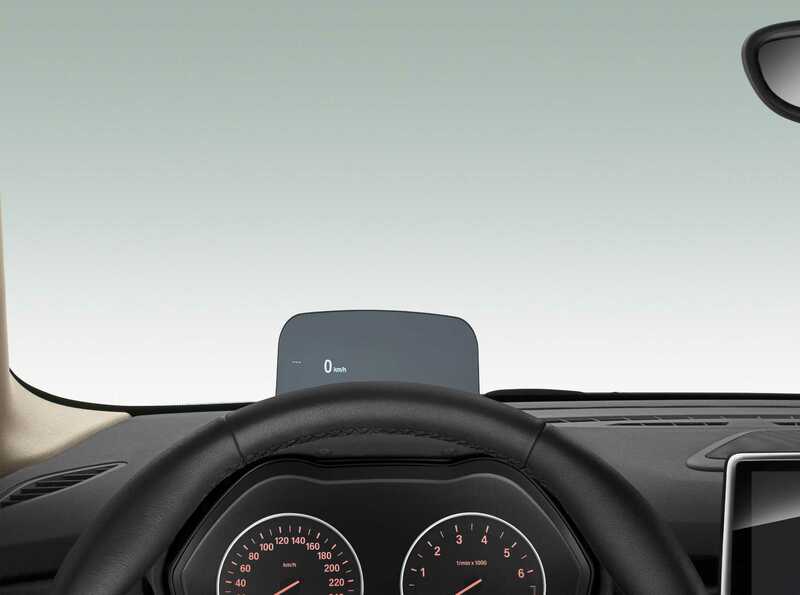 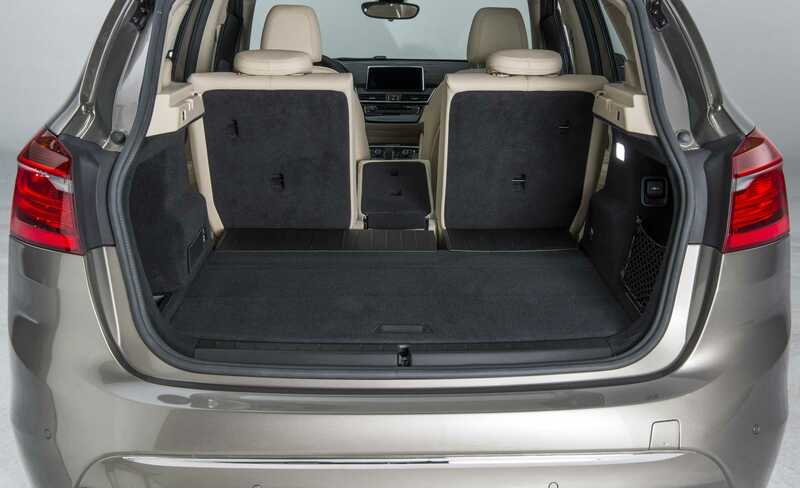 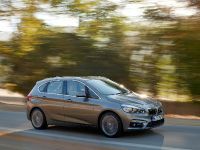 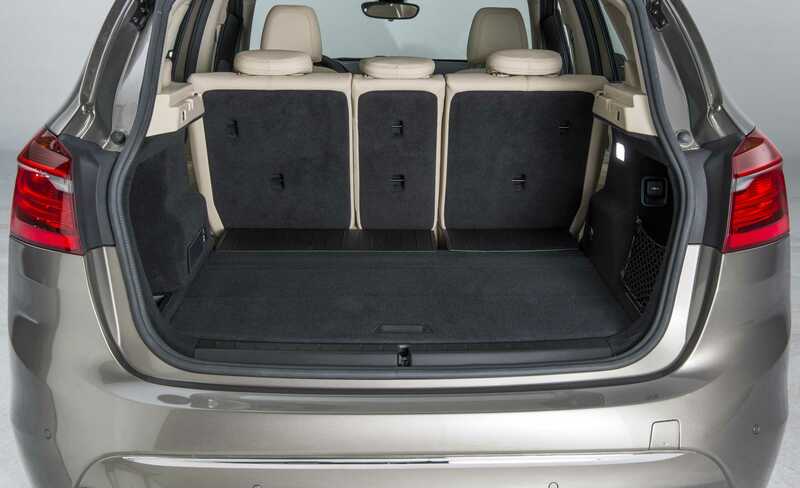 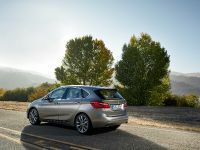 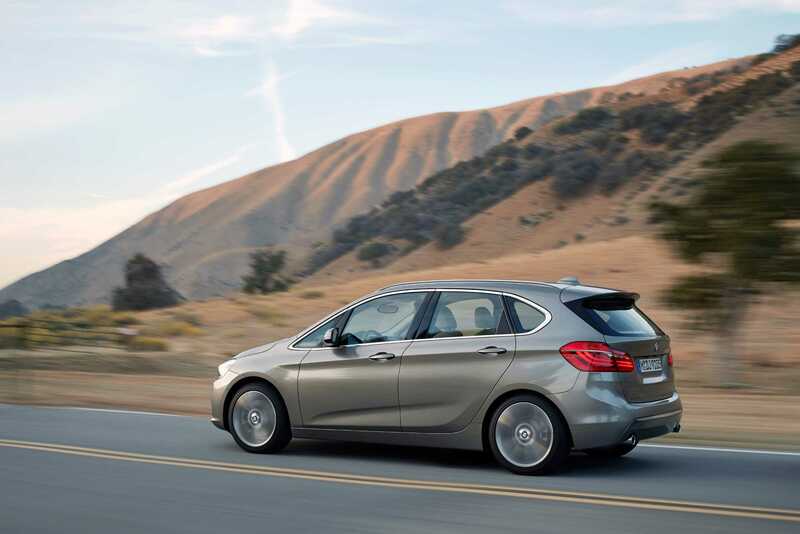 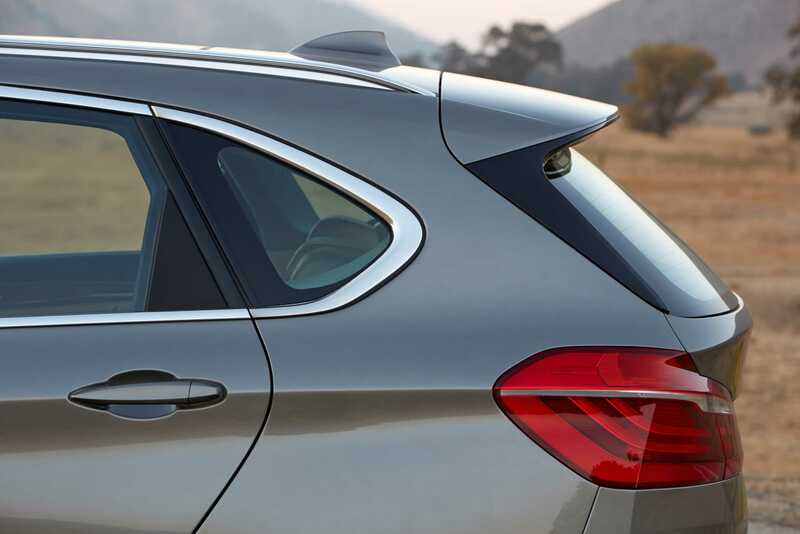 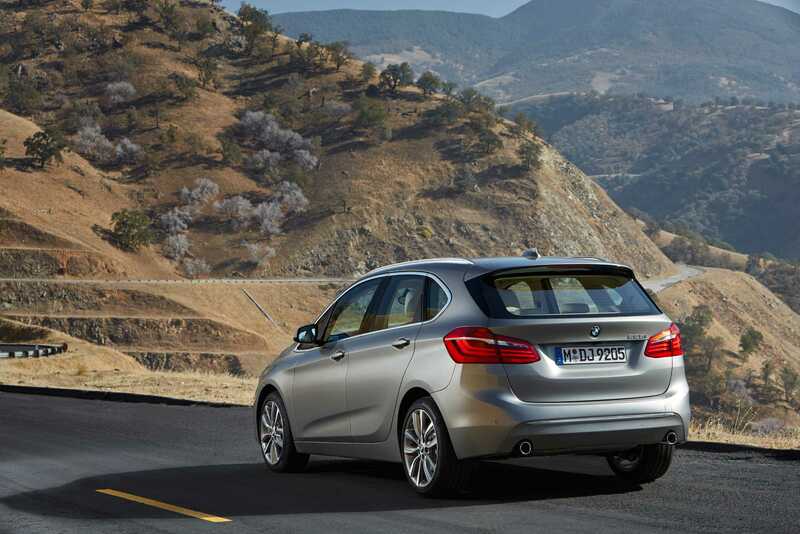 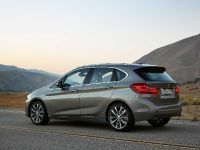 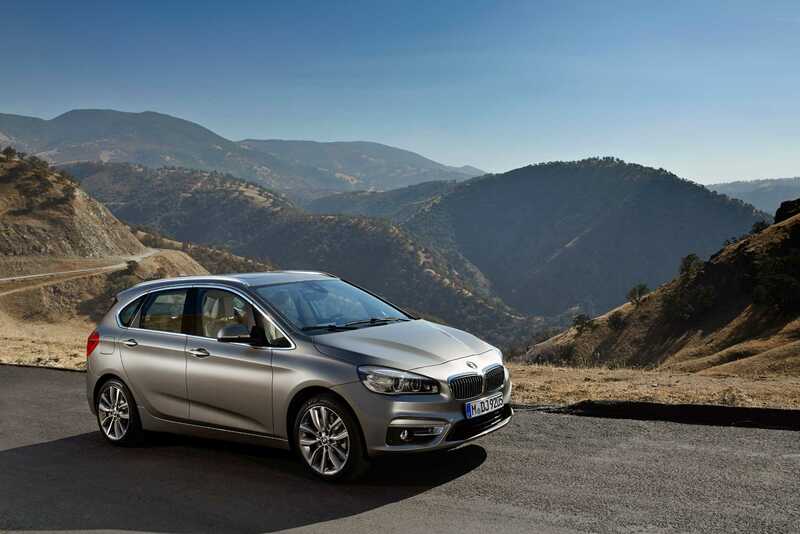 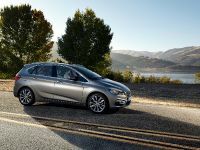 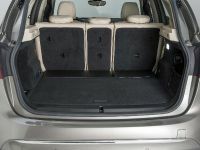 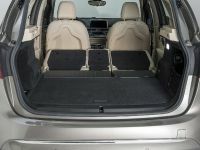 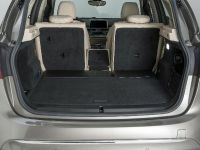 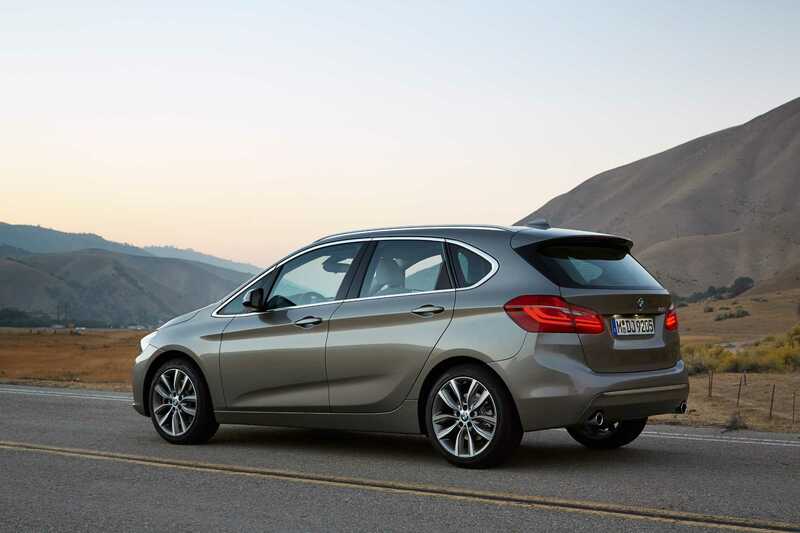 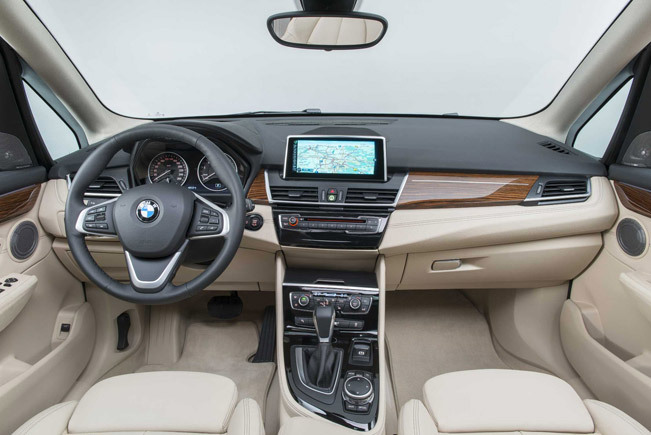 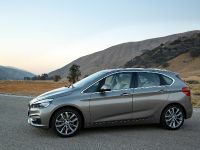 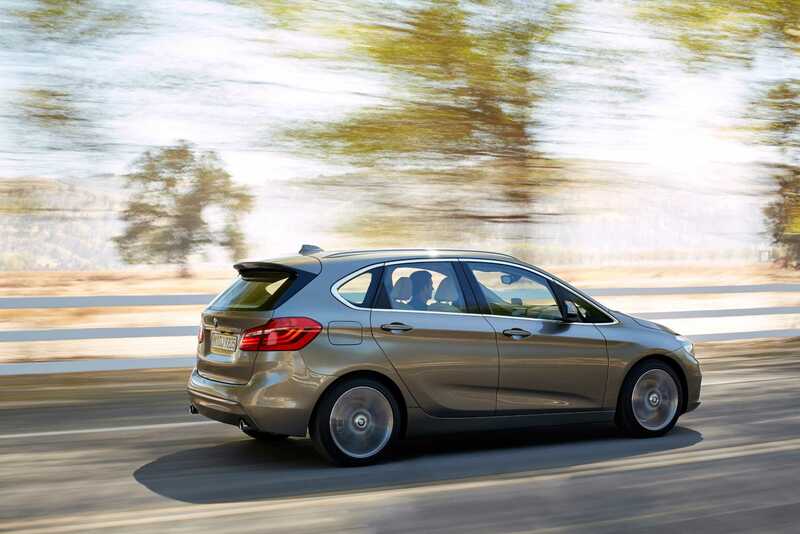 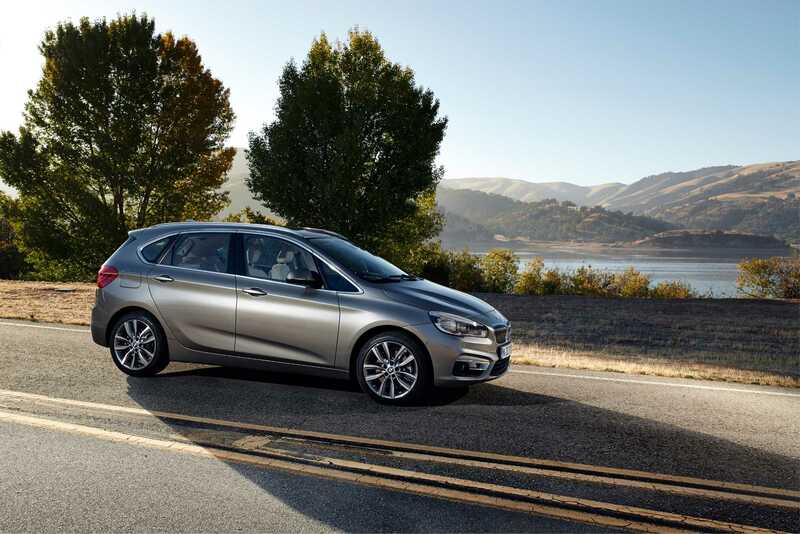 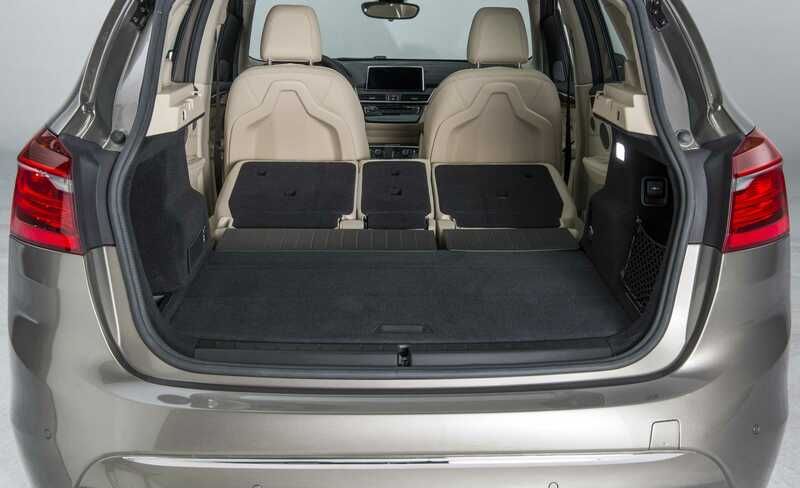 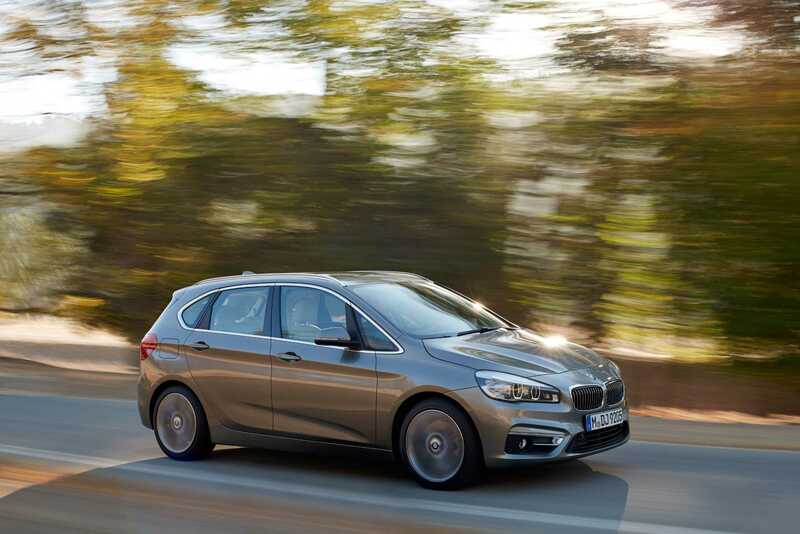 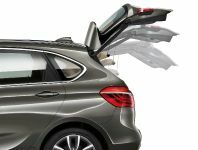 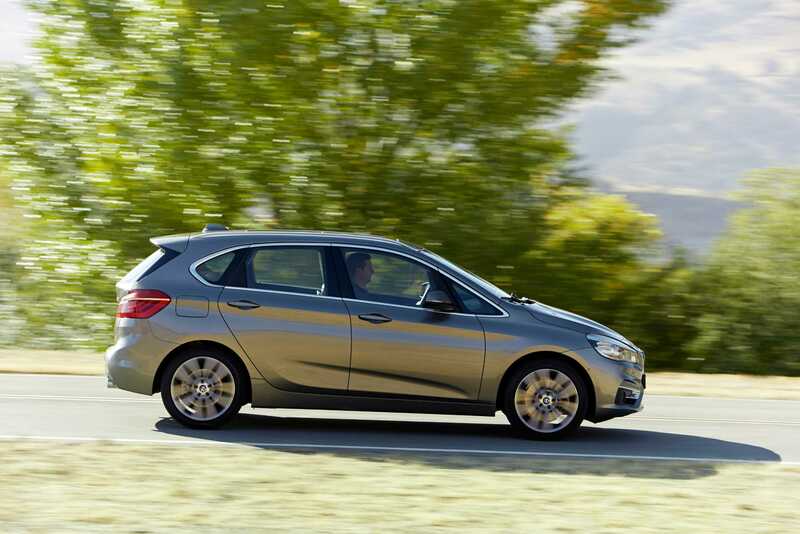 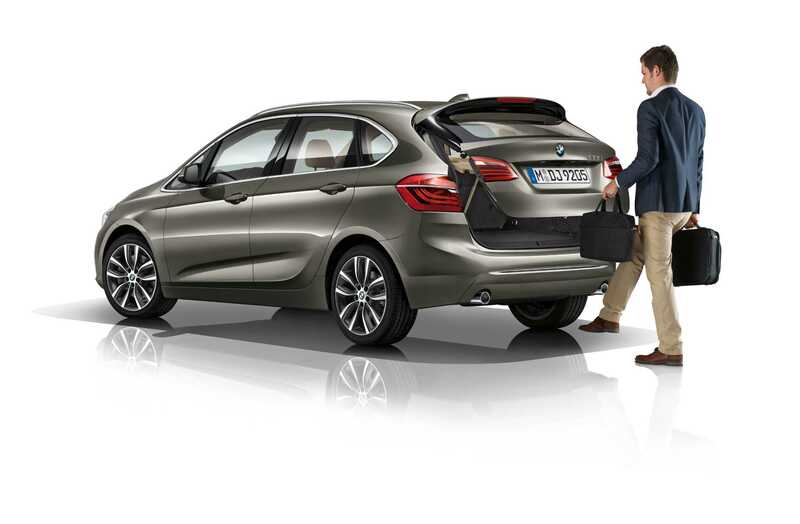 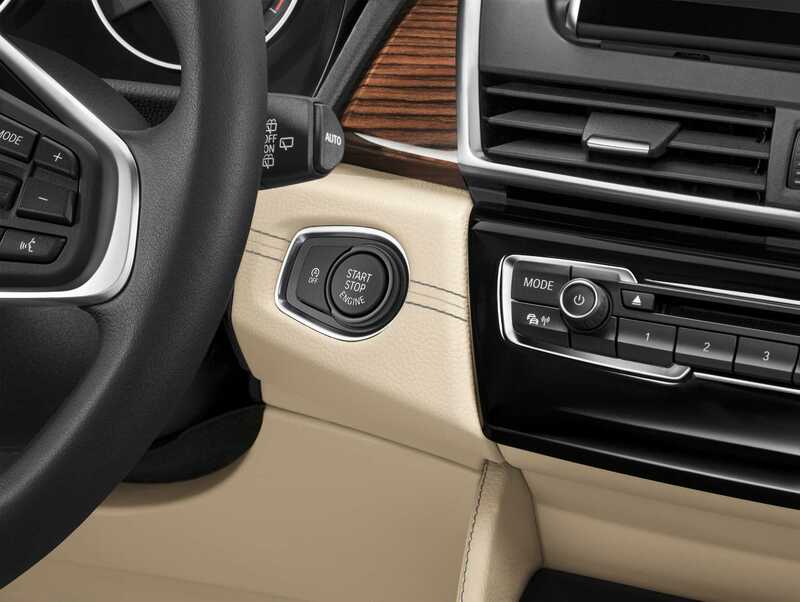 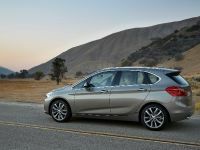 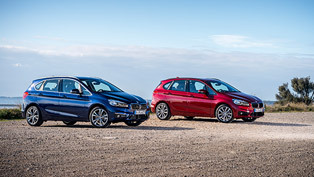 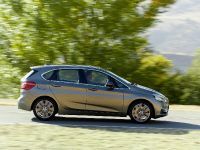 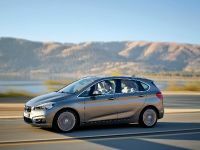 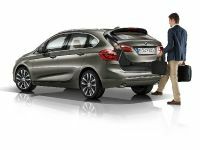 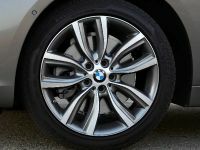 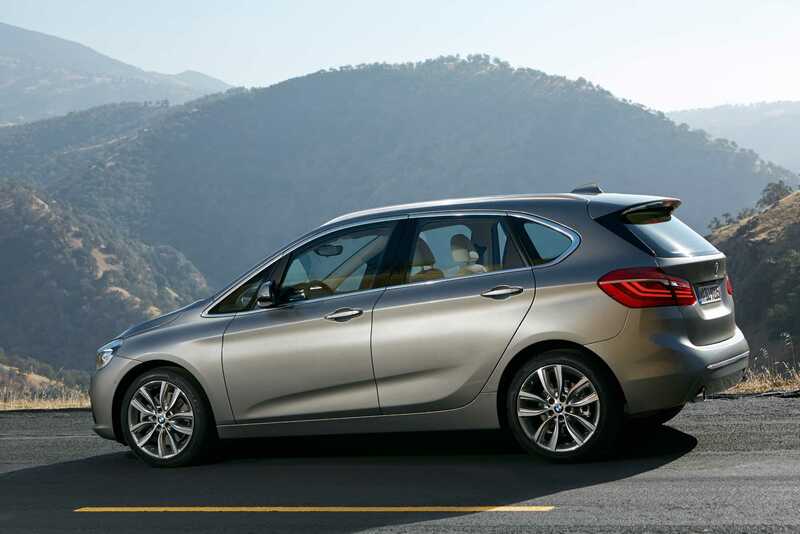 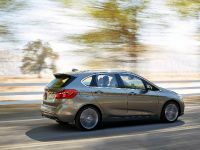 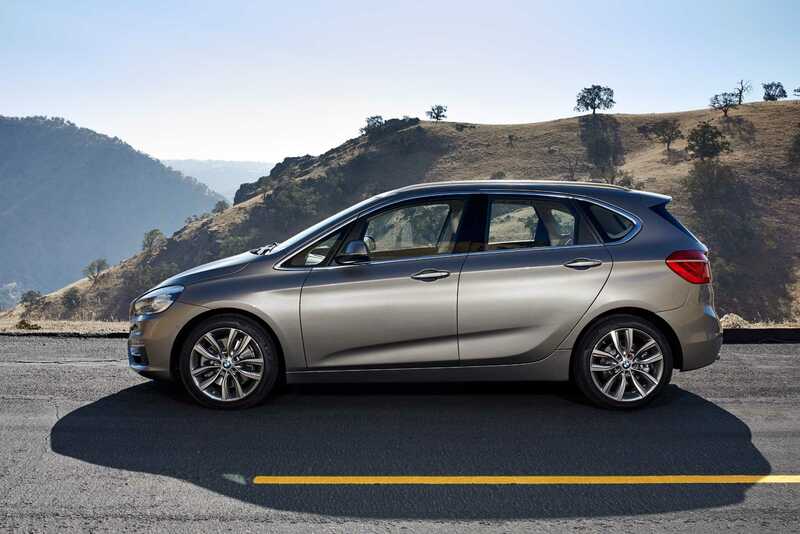 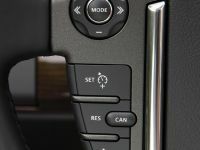 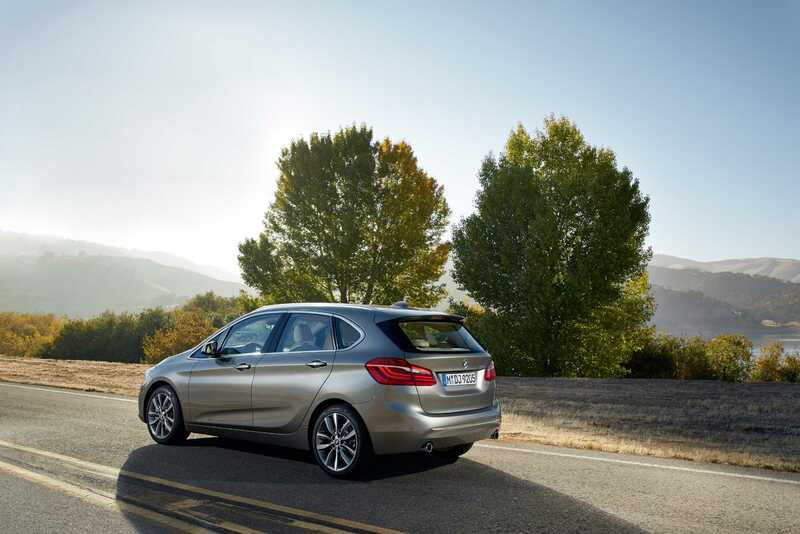 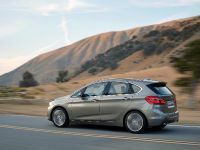 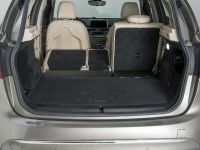 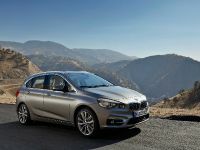 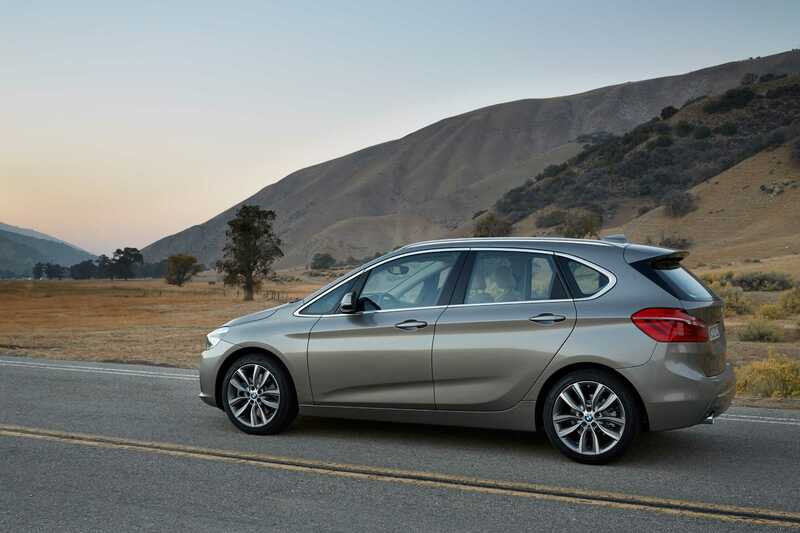 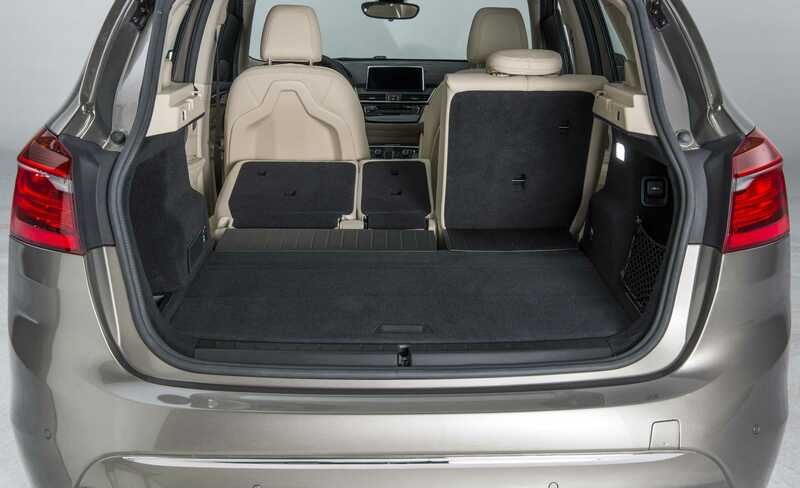 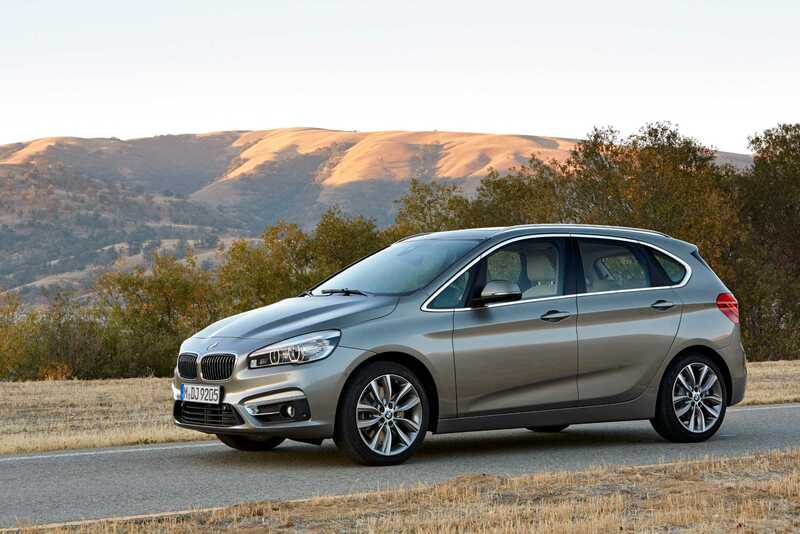 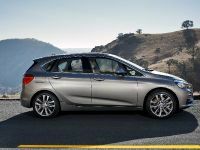 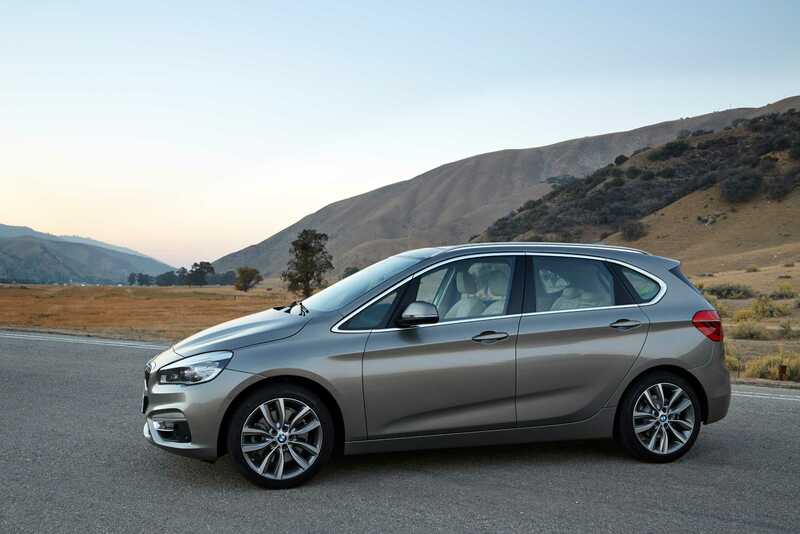 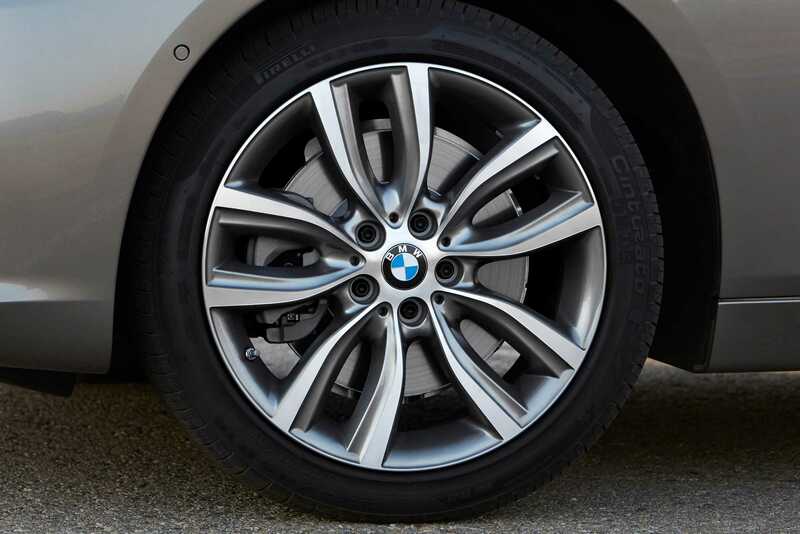 The 2-Series Active Tourer can be also ordered with BMW ConnectedDrive Services & Apps. 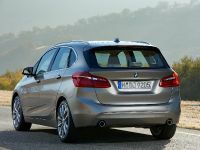 The engine range includes a 218i – a 1.5 liter three-cylinder turbocharged petrol – 136HP (100 kW) and 220Nm (162 lb-ft). 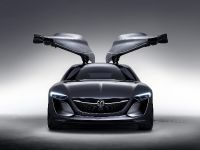 0-100 km/h in 9.3 seconds and a top speed of 200 km/h (124 mph). 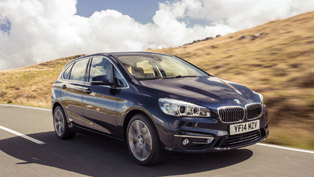 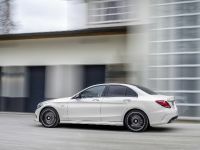 It will return 57.6 mpg UK – 4.9 l / 100 km with CO2 emissions of 115 g/km. 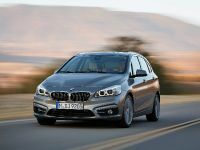 The 225i has a 2.0-liter four-cylinder turbocharged petrol – 231HP (170 kW) and 350Nm (258 lb-ft) of torque. 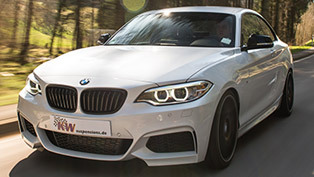 0-100 km/h in 6.8 seconds and a top speed of 235 km/h (146 mph). 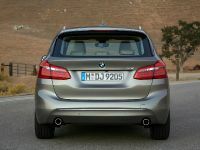 The diesel variant is only one – 218d – a 2.0 liter turbodiesel – 150HP (110 kW) and 330Nm (243 lb-ft). 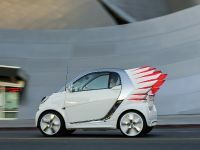 0-100 km/h in 8.9 seconds and a top speed of 205 km/h (127 mph). 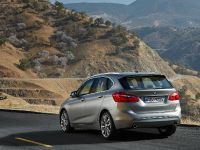 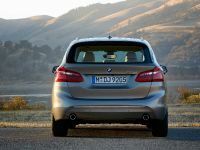 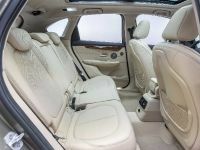 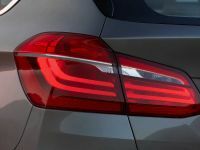 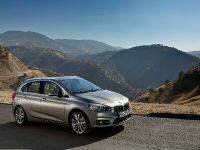 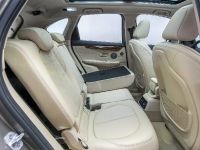 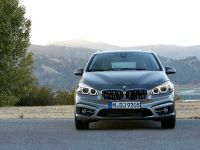 BMW will also produce a super-efficient 216d as well as 220d and 220i. 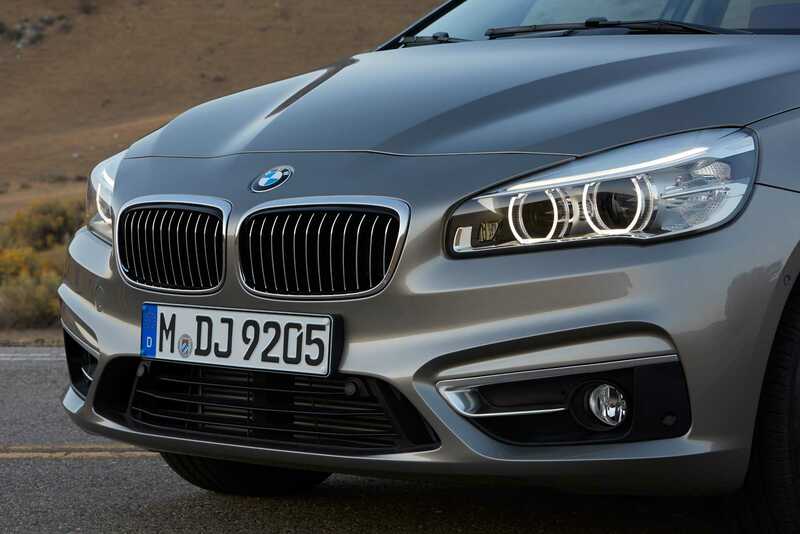 There will be xDrive versions of the 220d and 225i.